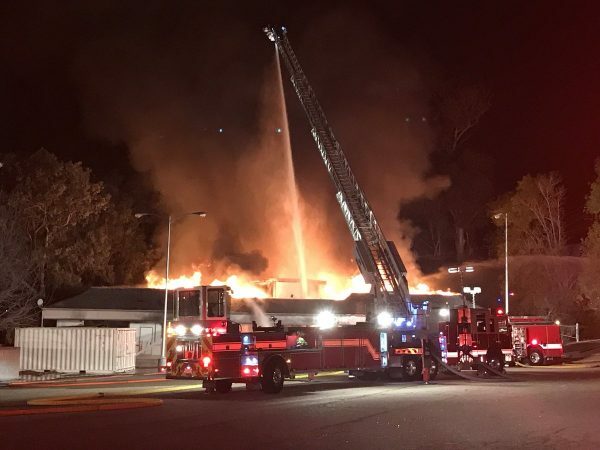 At about 3:30 a.m., a fire broke out in a building on Johnson Avenue and Southwood Drive. Firefighters arrived at the scene within four minutes of the call and contained the blaze to the single building. 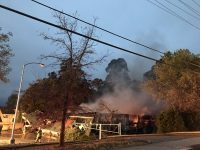 With help from Cal Fire, the Five Cities Fire Authority and the Atascadero Fire Department, San Luis Obispo firefighters extinguished the blaze. No one suffered injuries as a result of the fire. Firefighters have spent much of the morning mopping up the blaze. Police Chief Deanna Cantrell said Johnson Avenue would remain closed until about 10 a.m. Both the Tribune and CalCoast reporters should have asked neighbors what business or businesses occupied that building. It’s where kelrick has the plays and musicals adjacent to the church.